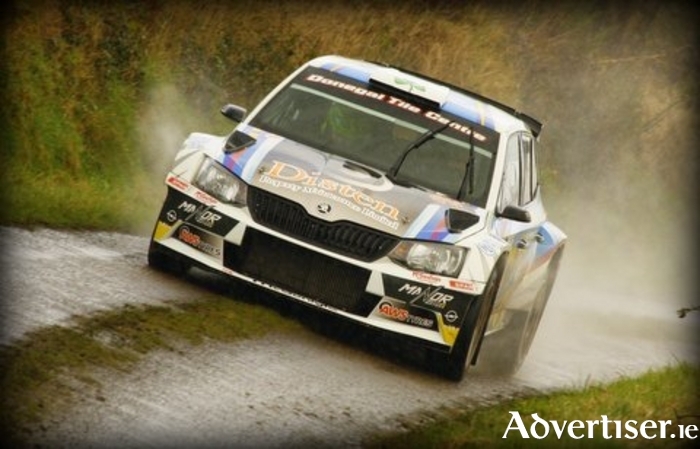 Joseph McGonigle and Ciaran Geaney who are seeded number one for this weekend's Mayo Stages Rally. After much deliberation on the running order of competitors, the entry list was released last Saturday night in the lead up to the Óstán Oileán Acla, Connacht Print And Signs, Mayo Stages Rally which takes place this coming weekend. Entries are still coming in for this motorsport spectacular and Mayo and District Motorsport Club is looking forward to welcoming some 80 crews in addition to the numerous motorsport fans who will be descending on Achill Island. There will be plenty to do for all ages on Saturday evening in the vicinity of Óstán Oileán Acla, and Mayo and District Motorsport Club welcomes everyone to a fun filled evening commencing at 6pm. There will be live music with Michael S Togher, bouncy castles, and prize giving for the winners of the recent road safety colouring competition from all seven national schools on the island. At 8pm they will welcome some of the top rally cars on to the island, in true Achill tradition, they will be escorted across the bridge by the Achill Pipe Band together with teams from Achill GAA and Achill Rovers Soccer club. The top 10 rally cars and all local competitors will then cross the start ramp outside the hotel. This will be a great chance to meet the drivers and navigators and also an opportunity to get up close to the competing cars. The organisers look forward to the competitors soaking up the wonderful hospitality for which Achill is famous. Tom McGinty will be providing music in Rally HQ from 9.30pm and he will keep the atmosphere going until the early hours. Sunday, it will be down to business with roads closing early that morning and first car will appear on Stage one at 9.55am. These stunning stages chosen by clerk of the course Trevor O'Connell and his team will be a joy to watch with amazing backdrops along the Wild Atlantic Way. Service will be held at the Sandy Banks Caravan Park in Keel, which will be accessible to all to wander around and admire the crews as they put in the hard work keeping the cars in check for the following stages. After all the stages are run, competing cars will return to Óstán Oileán Acla at approximately 4.50pm, where the crews will celebrate as they cross the finish ramp, followed by prize giving.